A day after dropping a bombshell announcement about its possible privatization, Tesla is back to its candid, humorous ways on social media, with the electric car company uploading a rather strange video featuring a paint applicator robot for the Model 3 — a machine that looks uncannily similar to a cow’s udder. Topping the post off was the perfect caption — a series of emojis including a cow and a robot. Model 3 paint applicator ? ??? Tesla’s recent upload stands as a lighthearted contrast to the seriousness surrounding the company and its bid to go private. Elon Musk surprised the markets on Tuesday by announcing that he was considering taking Tesla private at $420 per share, and that funding has been secured. The market reacted strongly to the news, pushing the company’s stock up 11% before the day’s trading ended. Musk’s announcement also triggered a wave of new doubts from the company’s critics, some of whom alleged that the privatization bid went under Tesla’s board of directors, or that Musk might have broken the law by revealing his plan on Twitter. Amidst all the tension presently surrounding the company, fun, harmless social media posts such as the Model 3’s udder-style paint applicator are a reminder of Tesla’s fun nature. Elon Musk is never one to hesitate when it comes to having some fun, even at his own expense, and this personality extends to his companies. Stuffing a sports car on a rocket and sending it to space, naming a boring company as literally The Boring Company — these are trademarks of Musk’s character, and it is something that Tesla has lost a bit over the past few months. Tesla is the only one among Musk’s companies that is publicly traded. It is also the one that gets scrutinized the most. SpaceX launches might attract sensational headlines from mainstream media every so often, but they are nothing compared to the negative coverage that Tesla draws. This is something that Elon Musk has continuously battled over the past few months, and unfortunately for the CEO, there were numerous times when he lost control of the narrative. In a letter to employees explaining why he is considering taking Tesla private, Musk mentioned that a departure from the public markets would likely create a setup where “there are no perverse incentives for people to try to harm what (the company is) trying to achieve” — a statement seemingly directed at the company’s critics and short-sellers. 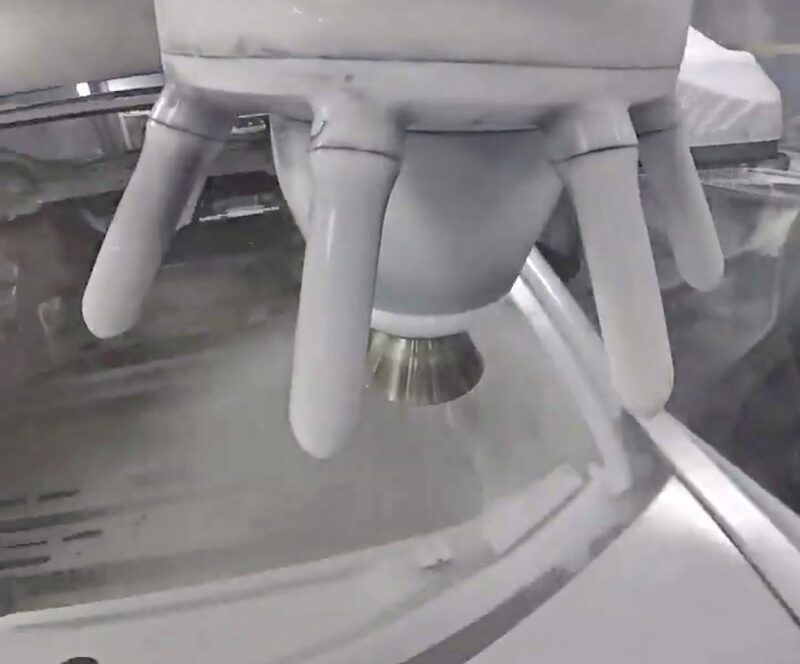 In a way, Tesla’s fun upload featuring its robot udder Model 3 paint applicator is not just the company showing its more playful side. It is also Tesla’s way of showing that its paint shop — one of the sources of bottlenecks in the Model 3 production in Q2 — is working well. The Model 3’s production has quite literally passed through manufacturing hell since the vehicle started rolling off the assembly line last year. Elon Musk even noted in a previous interview that the whole ordeal had left him with permanent mental “scar” tissue. One of the sources of these bottlenecks is the company’s paint shop. Several reports published in Q2 alleged that Tesla’s paint shop was contributing to the “sluggish” pace of Model 3 production due to improper cleaning, maintenance, and insufficient training for new employees. Reports about the company’s paint shop also alleged that Tesla’s employees were worried about their health due to the fumes from the paint the company is using. Tesla denied these reports, stating that its paint shop is regularly monitored and maintained, and that it is continually improving the training of its staff. In the Q2 2018 earnings call, Elon Musk specifically mentioned the paint shop as one of the areas where Tesla is looking to improve. While discussing the systems it would employ in its upcoming factories such as Gigafactory 3 in China; Musk stated that Tesla is in the process of the figuring out how to make the paint shop a lot simpler. “I think we can be a lot more efficient with CapEx, and that would include at least a factory module and pack production, body shop, paint shop and general assembly. We’re also figuring out how to make the paint shop a lot simpler and general assembly a lot simpler,” Musk said.